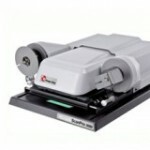 The ScanPro 3000 scanners come with a variety of innovative and useful features that allows users to offer a better service to their clients. Capitalizing on the high definition camera, a powerful zoom function enables document enlargement of up to 800% to make even the smallest print legible, with automatic color, brightness, contrast, rotation and focus controls available by using the intuitive touch screens. This means users can select whole documents or specific areas they want to print with image quality guaranteed. Ultra High Definition – Scan in standard definition or elect to scan in ultra high definition to save small text and image details. PDF/L Smallest File Size – This layered file format saves text as high resolution BiTone while saving images as high resolution grayscale. Clear-Text – Make your scans of microfilm clear, clean and crisp. This patented technology provides black text on a white background with even density. Word Searchable PDF – The ScanPP 3000 uses ABBYY Fine Readers to OCR your microfilm page. This world class OCR software is consistently picked by researchers for accuracy and speed. LIBRARY-Quiet – Designed for quiet operation in library and office settings. FOCUS-Lock – Provides full time image focus of your microfilm. No need to manually focus or wait for auto focus to complete.